Even as the BJP will chalk out its agitation programme against the UPA government on coal block allotments later this week, the ruling combine has lost no time in launching its counter offensive, including a sharp attack against the Comptroller and Auditor General (CAG). Union Home Minister Sushil Kumar Shinde today termed the proposed National Counter Terrorism Centre (NCTC) as a �good move�, saying that he would discuss the matter with the chief ministers. 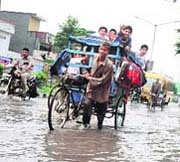 The late burst of rain in August and September has dispelled fears of drought-like conditions in Haryana. The state�s rain deficit is down from 73% at the end of July to about 30% as of Monday. The Congress, the BJP and other major political parties may be diametrically opposite to each other ideology-wise, but when it comes to funding and finances, there are common connections with �trusts� floated by top corporate houses and similar tricks to circumvent law and hide incomes. The Supreme Court today refused to quash criminal proceeding against former Punjab and Haryana High Court judge Nirmal Yadav in the 2008 cash-at-judge's door scam. WORLD: Taliban ready for ceasefire, to disown Qaida? At least 20 persons were killed when an HRTC bus fell into a deep gorge, about 25 km from Palampur. Sources said the 42-seater bus bound for Ashapuri � a remote area in Kangra district � from Palampur was overloaded as it was the last bus to depart. At least 15 passengers are missing. The Afghan Taliban said on Monday they were doing everything in their power to try to kidnap or kill Britain�s Prince Harry, who arrived in Afghanistan last week to fly attack helicopters. Days before External Affairs Minister SM Krishna reached Lahore to shake hands with chief minister Shahbad Sharif on Sunday, the warmth in this part of Punjab was being gently stirred up, gastronomically. Near the Attari-Wagah border, the best of cuisines from both sides of Punjab waited to tickle the taste buds. Diplomacy could wait, after all, with Punjabi 'tadka' ready to serve up a preamble.